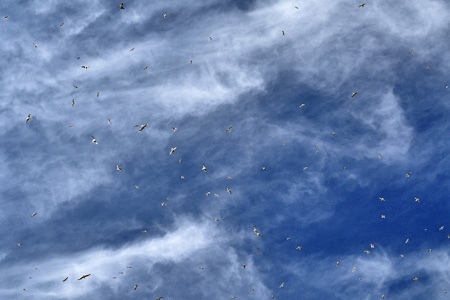 When I arrived home from work on Wednesday, there was a mass of gulls very high over my garden, each one gliding in its own little circles, creating overlapping, rotating patterns in the sky. You can just make out some of the flock here. There are actually 94 gulls in this photo. Yup, I counted them (and they are a mix of Herring, Black-headed and Mediterranean for those who like to know these things). I reckon in total there were maybe 800 or so gulls in total, and most directly in the airspace over my garden. This means just one thing on a sutry summer's day - it must be Flying Ant Day. 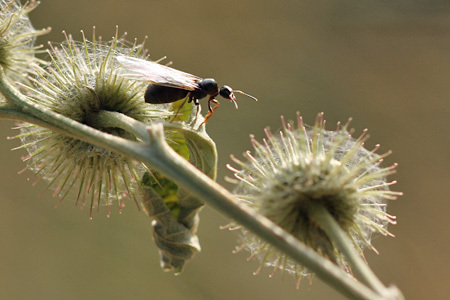 Or, to be more correct, one of the Flying Ant Days, for there are usually several in a season. I bet the same happened in many a town here in Sussex, and indeed perhaps more widely, for the emergence of flyingants tends to be incredibly well synchronised, thought to be triggered by hot and humid weather conditions. The height of the gulls showed that the ants were already well airborne, so when I went into the garden, just a few stragglers were still scurrying their way up to the tops of grass stems and seedheads to launch themselves off. 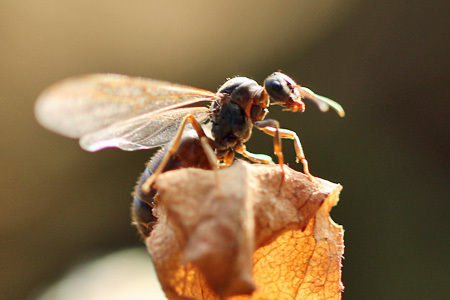 Flying Ant Days are when sexually mature, double-sized, winged males and 'princesses' emerge from their nests. Their mother (the queen) and her team of several thousand wingless worker daughters have been preparing for the big day, and now the time has come. The queen stays put in her nest while all this goes on, for amazingly she can reign for 20 years or more. So this is about sending out pioneering daughters and sons up into the skies to mix and mingle with those from other nests. For each male, it is all about securing one of the 'princesses' in flight. He will only survive at most a couple of days, but if the gulls, Starlings and Swifts have anything to do with it, his time could be much more limited than that. For each female, she will try to mate with several males, and the store of sperm she collects will have to last her a lifetime - it is good to have a mix of genes from different males to pass on. Those few winged females that survive then fly back to earth, nip off their own wings, and either enter an existing nest, or find a warm place under a paving slab or in a crack in the lawn to set up their own nests and raise their own broods of workers. Only a tiny fraction of those that took to the skies on Wednesday will actually make it, but you have to hand it to ants. This is one of the most successful groups of species in the world, and their complex and collaborative colonies are a miracle of evolution that has seen them develop something called 'collective intelligence'. It means they achieve more together than they do alone. It's a reminder to us that competitiveness isn't the only way to rule the world! With thunderstorms ahead, it could be the trigger for the next Flying Ant Day where you live. If so, it is a chance to marvel. And should the skies above start to fill with birds, well, it's yet another way that your garden is supporting wildlife.